A few of my friends and I play a game around the holidays that’s basically a “if you could have anything in the world for Christmas, what would it be” hypothetical scenario. Whether it’s a slick new ride, a pair of designer shoes, or a set of sparkly diamond studs, these lists are comprised of our dream must-haves. I love playing this game – I’m a girl with a big imagination, so it’s typically filled with a bunch of wild, over-the-top wishes like an Aston Martin, Hermès bags and the like. This season I’ve partnered with Nordstrom to share my Luxe List – aka the items at the top of my dream holiday wish list (hint, hint Mom)! Chloe has reached palette perfection with these sandals, and I can’t stop staring at this fabulous sequined stunner by Robert Rodriguez. I think the latter is the quintessential New Year’s Eve number, don’t you think? 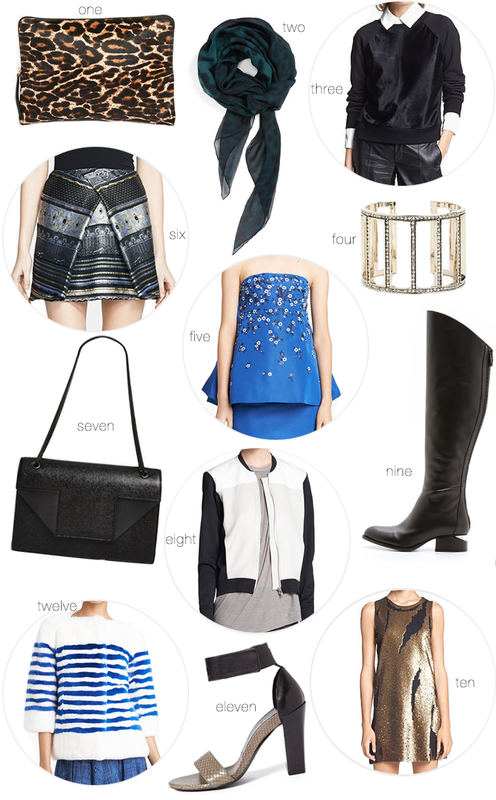 Shop the rest of my favorites below and click here to check out Nordstrom’s Designer Luxe Lookbook! Also, Nordstrom’s Half-Yearly Sale is going on, so now really is the best time to shop and stock up on holiday gifts! This Kate Spade dress and this DVF number are PERFECT for work-to-weekend (so versatile), and these YOLO cards are hilarious. Get to it! This post was sponsored by Nordstrom but all opinions are my own! Thank you for supporting the brands that make The Style Scribe possible. #9 and 12 are amazing! I’m dying over that Robert Rodriguez dress! That gold/bronze is to die for. Ohhh, #12 is completely stealing my heart. Love! Love the Robert R. dress and the Kenzo skirt! Want want want everything on your list!!!! Ah those Alexander Wang boots are so cool I love them wish I could afford them so chic. ohh i LOVE that kenzo skirt! I want that metallic dress to wear for my bday! that RR dress for NYE is perfection. Oh my gosh I would be lying if I said I wasn’t obsessed with everything on this list! I’m especially loving #6,8 &9! This Oscar de la Renta blue dress is heaven! Perfect! Ooh these are all gorgeous! I will take one of each. If I could have anything it would be a trip somewhere fabulous! Loooove those boots!!! love the open toed shoes!